The Welterweight division is known to possibly be the most competitive with their five world champions. Hopefully in the near future they will fight one another to see who the “Real World Welterweight Champion Is”. The most well- known is southpaw Manny “Pac Man” Pacquiao, 61-7-2 (39), of General Santos City, PH, who won his first world title back in December of 1998 though behind on points going into the eighth round. In that eighth round he knocked out Chatchai Sasakul, 32-1-1, of TH at the Tonsuk College Ground, Phuttamonthon, in TH, for the WBC World Flyweight Title. “Pac Man” is a six division world champion. In his last defense of his WBA World Title he defeated former champ Adrien “The Problem” Broner, 33-3-1, at the MGM Grand, Las Vegas, NV, in January. Keith “One Time” Thurman, 29-0 (22), defended his WBA Super World Title in January winning a majority decision over Josesito Lopez, 36-7, at the Barclay Center, Brooklyn, NY. It was his first fight since March of 2017 when he won a unification bout over WBC champ Danny “Swift” Garcia, 33-0, at the Barclay Center but had the WBC vacated due to the layoff. “One Time” defeated current WBC World Champ Shawn “Showtime” Porter, in June of 2016, at the Barclay Center. “Showtime” is now 30-2-1 (17), having won a split decision over Yordenis Ugas, 23-3, this past weekend in Carson, CA. This writer felt Porter won 120-108. There is no reason for a rematch. Since losing to “One Time” he has won four straight bouts and the WBC Title from Garcia in September of 2018, at the Barclay Center. 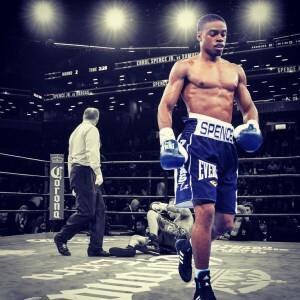 This Saturday the IBF World champion Errol “The Truth” Spence, Jr. 24-0 (21), of Desoto, TX, will defend his title against WBC World Lightweight champ Mikey Garcia, 39-0 (30), at the AT&T Stadium, Arlington, TX. In “The Truth’s” last bout he knocked out Carlos Ocampo, 22-0, of MEX, in the first round in Frisco, TX. Garcia last fought in July of 2018 defeating Robert Easter, Jr., 24-0, at the Staples Center, in L.A. The WBO World champ is 3-division world champion Terence “Bud” Crawford, 34-0 (25), of Omaha, NEB. He has an upcoming defense against former world champ Amir Kahn, 33-4, at Madison Square Garden, NYC, on April 20th. In “Bud’s” last fight he stopped Jose Benavidez, Jr., 27-0, in Omaha, in the twelfth and final round. The five world champions do not have a unification bout scheduled at this time. Only Spence and Crawford have scheduled bouts. Crawford is promoted by Top Rank, Spence and Thurman by Golden Boy, Pacquiao by his own MP Promotions and Porter by TGB in his recent fight. Most boxing authorities would probably say Crawford is the best. Thurman has proven to be the best prior to his layoff by many. Never bet against Pacquiao, and Spence is the future if he gets by Garcia. Porter is a long shot being the best but you never know. Who do you think is the best welterweight Champ in the World?